Qualitative health care is a fundamental right of all citizens of a given country. How this health care is delivered depends significantly on the economy, dedication, and quality of the health-care providers and the political will of the government of the country. Health care may be public run or organized by private health-care providers. We can also have an intercalated program where there is public–private partnership. Whichever way this basic fundamental human right is delivered, sustainability, affordability, and accessibility are vital to its success. The Nigerian health-care delivery can be broadly classified into two; the hitherto existing traditional medicine and the modern orthodox medicine which came to our shores with the arrival of the European colonialists. The traditional system is still patronized by most Nigerians and is known by different linguistic terminologies such as the “Wanzami” or Barber in Hausa and the “Babalawo” in Yoruba language. Traditional birth attendants also exist in all communities in Nigeria complemented by herbalist and spiritualists of different shades and callings. It is our aim to give a brief account of our observations on the Nigerian health-care system with a view to correcting the challenges by the government and the public in general. The Nigerian health care delivery can be broadly classified into two. The hitherto existing traditional medicine and the modern orthodox medicine which came to our shores with the arrival of the European colonialists. The traditional system is still patronized by most Nigerians and is known by different linguistic terminologies such as the Wanzami/barber in Hausa and the Babalawo in Yoruba language. Traditional birth attendants also exist in all communities in Nigeria complemented by herbalist of different shades and callings. A recently observed phenomenon is the combination of spiritual prayer healings mixed with religious mysticism which has become accepted by quite a large number of people. The second system is the modern health system that has passed through various stages of evolution from the 19th century which essentially is directed toward the explorers, missionaries, and the colonialists. Nigerians only became integrated into this system in bits, largely limited to those who serve the Europeans. Gradually, this was extended to the general populace but with segregation between Europeans and native Africans. This process of evolution has resulted in continuous remodeling through various plans. The first colonial development plan of 1945 to first national development plan of 1962. This was followed belatedly by the first National Strategic Health Development Plan (NHSDP) of 2004. The government then made an update to 2004 plan to accommodate the principles of primary health care under one roof. There were difficulties in execution and implementation of the NHSDPs. The most notable among which are poor funding, gross inadequacy of human resources, poor health care - behavior, poverty, and corruption with a capital “C.” Health-care system being an open system is affected by all of these factors in various negative ways, and that has resulted in the present situation that we are in. It is the objective of this write-up to discuss these difficulties as they relate to maternal and child health, cancer care, eye care, trauma, and noncommunicable diseases. All countries pride themselves in the quality of health care they provide to their citizens. How this health care is delivered depends significantly on the economy and educational level of the health-care providers and the political will of the government. It may be public run or organized by private health-care providers or an intercalated program where there is public–private partnership. Whichever way this basic fundamental human right is delivered, sustainability, affordability, and accessibility are keys to its success. Health care is viewed by many, as a matter of national security. The higher the quality of care received by the citizens, the greater the stability and economic productivity of the nation. Globalization has made health care a commodity to be sold to the highest bidder in some societies with two or three-tier systems accessible to the individual based on his purchasing power. There is a thriving industry of ferrying. The matter is not helped by those in authority at the highest level seeking treatment abroad for a common ear infection. We do not condemn search for care abroad in totality. However, we opine that it shall be used only where similar expertise is not available locally. It is our intention to discuss some aspects of this all important topics from the perspective of major aspect of health care, bringing to fore major problems with suggestions on how to improve on them. Maternal and newborn health remains one of the most important indicators to measure the level of socioeconomic development of a region or country. Although Nigeria has the largest economy in Africa, it is still regarded as a low-income country. 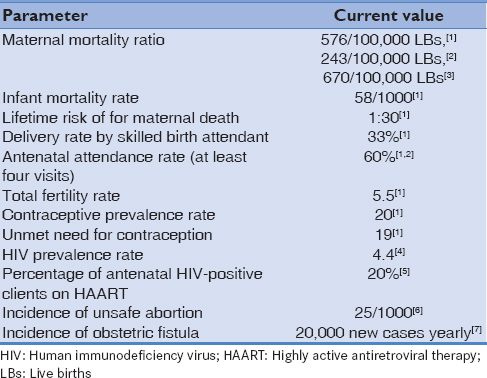 The current maternal health indices of Nigeria are shown in [Table 1]. Nigeria comes only second to India contributing over 10% of the global maternal deaths as against India with 14%. The maternal mortality rate (MMR) for the country is rather controversial. The United Nation (UN) agencies put the current figure at 670/100,000 live births (LBs), whereas the 2013 National Demographic and Health Survey (NDHS) gave a ratio of 576/100,000 LBs. Another government agency tracking the performance of the Millennium Development Goals (MDGs) documented a ratio of 280/100,000 LBs for 2014. What is not in dispute, however, is the wide regional disparity of MMR and that MMR is reducing at low pace not sufficient to meet the targets of MDG-5. The MMR in the South-West is one-tenth of the ratio for the North-East and one-fifth that for the North-West. Thus, maternal deaths are more in the northern parts of the country compare with the southern parts. The direct common obstetric causes of maternal deaths still remain hemorrhage, sepsis, preeclampsia/eclampsia, obstructed labor, unsafe abortion, and anemia. The socioeconomic determinants of maternal mortality are still prevalent - low educational level/status of women, poverty, poor reproductive health-seeking behavior, and poor communication and transportation. This is against the backdrop of the Nigerian weak health system with subsequent poor emergency obstetric services, particularly at the lower levels of care. The incessant strike actions by health workers in recent times at both state and federal levels is generally believed to contribute negatively to maternal mortality statistics. The impact of the strikes on maternal mortality is yet to be quantified. It is believed that interventions such as free maternal health care, midwife service scheme, and save one million life programs are largely responsible for the declining maternal mortality trend in Nigeria. However, the sustainability of these interventions is seriously threatened with the dwindling crude oil prices and by extension the economy. However, with renewed political will and concerted efforts, Nigeria may be able to meet the targets of Sustainable Development Goal (SDG-3). There is little or no change in the total fertility rate of Nigeria since the commencement of the current democratic process. It was 5.9 in 1999 and currently 5.7. Despite putting in place, a very robust population policy (Revised 2004 Population Policy) and perhaps the best in Africa, it did not translate into a palpable reduction in fertility rates in Nigeria. The current contraceptive rate (CPR) for modern contraceptives is 10% (despite high awareness rate of 80%) and the unmet need rate is estimated to be 17%. This is far below the African average of 30% and 10%, respectively. Misconceptions, fear of the side effects of contraceptives, poor community distribution services, low funding, and poor quality care are notable factors responsible for low CPR in Nigeria. Unsafe abortion still poses a great threat to the lives of Nigerian women. It is estimated that 15% of maternal death in Nigeria are accounted for by unsafe abortion with an incidence rate of 25/1000 women of reproductive age. Lack of access to quality postabortion care services, poor implementation of adolescence reproductive health policies at all levels, restrictive abortion laws, and low-quality contraceptive services, especially in rural communities among other factors are responsible for the high prevalence of unsafe abortion in Nigeria. Another established fact about the state of maternal, newborn, and child health in Nigeria is that the country contributes the highest number of pediatric human immunodeficiency virus (HIV)/AIDS in the world. It is estimated that there are about 60,000 neonates infected with HIV yearly in Nigeria. Only 15%–20% of pregnant women infected with HIV have access to a full complement of PMTCT services including ART. PMTCT interventions in Nigeria are largely donor driven with little or no budgetary allocation by the government at all levels. Obstetric fistula is yet another maternal health-related public health problem in Nigeria. Its incidence is observed to be increasing with nearly 20,000 new cases annually making Nigeria one of the highest contributors of the obstetric fistula burden in the African continent. In the past 5 years, the Government of Nigeria in collaboration with UNFPA established more national fistula repair/rehabilitation centers as a response to the rising incidence. However, to effectively reduce the burden of obstetric fistula in the country, stakeholders including the federal and state governments must invest in improving access to quality emergency obstetric care, particularly in rural and hard to reach areas, women empowerment, and girl child education. With the UN SDGs Agenda now in place, it might be a daunting challenge for Nigeria to meet the health-related SDG3 targets, particularly reducing the MMR to 70,000/100,000 LB, U5 MR to 12/1000, and universal access to reproductive health services for all. However, with renewed commitment to good governance and accountability, increased investment in high impact maternal and newborn health interventions, and women empowerment, Nigeria can be on the path of achieving SDG3 come 2030. Tremendous success has been achieved globally toward the reduction of childhood mortality although there is a disparity in the level of success achieved at individual country levels. Most of the success is from the middle- to high-income countries, but some developing countries such as Nigeria are recording slow progress. Infectious diseases such as malaria, diarrheal illnesses, and pneumonia still rank among the leading childhood killer diseases, with malnutrition underlying most of these conditions. Poor health-seeking behavior, lack of access to safe drinking water, and poor environmental sanitation, in additional to poor access to maternal health services, all contribute to these grim statistics. Therefore, there is a need to intensify current strategies and interventions to accelerate the progress in reducing childhood mortality in Nigeria. There has been a global decline in childhood mortality, over the past four decades. This is evident in the relatively low, global under-five mortality rate (U5MR) of 46/1000 LBs in 2013, as compared with the earlier figures of around 147/1000 LBs in 1970. However, this approximately translates to an unaccep[table 6].3 million child deaths in 2013 or 17,000 deaths per day. Furthermore, the rates of decline in the mortalities have varied across the different world regions. Thus, over the years, up to 75% of the global burden has emanated from the Sub-saharan Africa and South-East Asian regions.,, It is also noteworthy that the reductions in childhood mortality began, even before the Millennium Declaration of the year 2000 by the world's nations, where specific goals and targets enshrined in the MDGs were set, to reduce child mortality and other indices retarding global progress. The U5MR is the principal indicator used to monitor progress in child well-being, as it is the result of several inputs. U5MR is defined as the probability of dying, between birth and exactly 5 years of age, expressed per 1000 LBs. It is influenced by several inputs, including but not limited to, for example, availability of maternal and child health services, nutritional status of children, malaria, and diarrheal diseases. Other childhood indicators are infant mortality rate (IMR), which is defined as the probability of dying, between birth and exactly 1 year of age, expressed per 1000 LBs; neonatal mortality rate (NMR), which is defined as the probability of dying, during the first 28 completed days of life, expressed per 1000 LBs. Nigeria currently ranks as the 9th country with the highest U5MR in the world, with a mortality rate of 117/1000 LBs. This approximates to 804,000 deaths in the year 2013, or one child death in every eight children, under the age of 5 years. The corresponding IMR and NMR are 74 deaths per 1000 and 37 deaths per 1000, respectively. This implies also that about one in every 15 children die before reaching their 1st birthday. However, the grim statistics undermine the fact that IMR and U5MR declined by 26% and 31%, respectively, from 1998 to 2013. It is also noteworthy that neonatal deaths account for about 50% of the IMR, whereas the corresponding deaths before 1 year of age account for about 65% of the U5MR. There is also a wide variation in the geographical distribution of the childhood deaths, with the North-West zone of Nigeria having twice to three times the child mortality rates, when compared with the South-West zone of the country. In general, most of the childhood deaths were accounted for by the northern part of the country. The North-West and North-East zones combine to give the highest U5MR in Nigeria, whereas the South-South and South-East give an intermediate number of deaths, with the South-West and North-Central zones giving the lowest figures., Furthermore, rural areas account for a greater part of the mortalities, compared to urban areas., Moreover, these differences have shown strong statistical significance. There is a substantial difference in the causes of death from one country to another. However, the majority of deaths from developing countries, are of preventable causes.,, Of the 6.3 million child deaths in 2013, Nigeria alone contributed about 12%, second only to India who had more than 1 million child deaths; notwithstanding that Nigeria ranked the 9th worst U5MR, and India ranked 53rd., It should, however, be stressed that these figures represent a 45% reduction in U5MR although it still falls short of the MDG-4 target of 67%. From the foregoing, it is evident that geographical location such as residing in a developing country or rural dwelling as well as being from the northern part of Nigeria, are significant risk factors for a child dying before the age of 5 years., However, there is a preponderance or coincidence of several behavioral and sociodemographic factors that equally influence U5MR in these regions. Health-seeking behavior, as well as appropriate medical services will be a key factor in the pattern of morbidity and mortality of any community. According to the most recent NDHS 2013 by the National Population Commission of Nigeria, only a third (32%–35%) of children with fever or ARI, sought for medical attention from a health provider or health-care facility. Likewise, only 34% of children with diarrheal illnesses received oral rehydration solutions. This poor attitude will no doubt encourage complications or fatal outcomes, for otherwise treatable minor ailments. Indeed, logistic regression analyses have shown a 45% reduction in U5MR in siblings of mothers that have a high health-seeking behavior. Earlier studies have also highlighted the interplay or additive effects of measles, malnutrition (underweight), and Vitamin A deficiency (VAD), on child mortality. Measles infection predisposes children to diarrheal diseases and pneumonia, which are independent causes of child mortality on their own. It is not surprising, therefore, that a reduction of measles infections mirrors a reduction in child mortality. VAD, on the other hand, leads to higher morbidity in measles, pneumonia, diarrhea, and malarial illnesses. Yet, Nigeria still has a Vitamin A supplementation gap, with the current rate at 70%. The potentiating effect of malnutrition on child mortality has long been established. The World Health Organization (WHO) demonstrated that approximately 56% of child deaths from developing countries had underlying malnutrition. This potentiating effect occurs in two ways; by potentially increasing the occurrence of infectious diseases such as tuberculosis, pertussis, especially in children with mild- to-moderate malnutrition, as well as the effects of severe malnutrition itself on child mortality., Unfortunately, Nigeria is still bedevilled by malnutrition; while the proportion of stunting improved among children from 41% in 2008, to 37% in 2013, the proportion of wasting actually increased in the same time period from 11% to 18%, and one in every four children are underweight, indicating a more recent nutritional deficiency., The majority of these malnourished children reside in the northwestern and northeastern part of the country. Poor personal hygiene, poor environmental sanitation, and poor access to safe drinking water, all lead to a high incidence of diarrheal diseases, as well as malaria and ARI. Environmental pollution from the use of solid fuels is also a major factor influencing respiratory tract infections. However, only 64% of Nigerians have access to improved sources of water supply, and a mere 28% have access to improved sanitation facilities. Majority of households (70%) still use solid fuels, so environmental pollution is widespread. In addition, 50% of households have at least one insecticide-treated mosquito net (ITN), but only a staggering 17% children sleep under an ITN.,, Therefore, perpetuation of these socioeconomic problems will only increase childhood mortality from ARI, malaria, diarrheal illnesses, and so on. Although tremendous success has been achieved in the reduction of child mortality in Nigeria in the past three decades by about 45%, it still falls shy of the 67% target for the MDG-4 which sought to reduce child mortality by at least two-third by the year 2015. It, however, means that the interventions and measures employed do work but need to be pursued vigorously and with a greater commitment to reverse the trend of childhood mortality in Nigeria. Ophthalmology is the branch of medicine that deals with the anatomy, physiology, and diseases of the eye  and an ophthalmologist is a specialist eye doctor who diagnoses and treats all eye diseases. Many ophthalmologists are also involved in scientific research on the causes and cures for eye diseases and vision disorders. There are other eye care workers allied to ophthalmology referred to as allied ophthalmic personnel but are not medical doctors and include optometrists, ophthalmic nurses, optical technician, refractionist, orthoptist, and equipment technicians. The ophthalmologist and allied ophthalmic personnel make up the eye care team, and their availability and expertise are critical to rendering quality eye care services to the populace. The estimated number of people visually impaired in the world is 285 million, 39 million blind, and 246 million having low vision; 65% of people visually impaired and 82% of all blind are 50 years and older. The principal causes of visual impairment are uncorrected refractive errors and cataracts, 43% and 33%, respectively. Other causes are glaucoma, 2%, age-related macular degeneration (AMD), diabetic retinopathy, trachoma, and corneal opacities, all about 1%. A large proportion of causes, 18%, are undetermined. The causes of blindness are cataract - 51%, glaucoma - 8%, AMD - 5%, childhood blindness and corneal opacities - 4%, uncorrected refractive errors and trachoma - 3%, diabetic retinopathy - 1%, and the undetermined causes are 21%. The National Blindness and Visual Impairment Survey in Nigeria was conducted from 2005 to 2007. It found that about 4.25 million adults aged 40 years in Nigeria are visually impaired or blind. It is estimated that 1.13 million individuals aged 40 years are currently blind that is having a BCVA of <3/60 in the better eye. A further 2.7 million adults aged 40 years are estimated to have a moderate visual impairment and an additional 400,000 adults are severely visually impaired. Cataract, glaucoma, and corneal scarring, respectively, were the leading causes of blindness. Uncorrected refractive errors were the leading causes of mild and moderate visual impairment (<6/12–6/60) which occurred in 2.46 million adults. Hypertension Stage 2 occurred in 10.9% of participants (i.e., systolic blood pressure [BP] of ≥160 mmHg and diastolic BP of ≥100 mmHg) and hypertension Stage 3 occurred in 3.9% (i.e. systolic BP of ≥180 mmHg and diastolic BP of ≥110 mmHg). Diabetes was diagnosed in 7.1% of participants in the normative database. Eighty-five percent were unaware that they had the condition. These latter two systemic will increase the number of cases of posterior segment visual impairment, blindness, and the need for vitreoretinal services. Ophthalmologist (Fellow) 1:500,000; 1:250,000, Ophthalmologist (Diplomates) 1:250,000; 1:166,666, Optometrist 1:500,000; 1:250,000, Ophthalmic Nurse 1:125,000; 1:83,333, Optical Technician 1:250,000; 1:250,000, Refractionist 1:250,000; 1:166,666, Orthoptist 1:500,000; 1:250,000 and Equipment Technician (one per centre) 1:166,666; 1:500,000. There are roughly 450–500 Ophthalmologists (Fellows and Diplomates) and over 3000–4000 optometrists giving a ratio of 1:377,777–340,000 and 1:56,666–42,500, respectively. There is an unequal distribution with as much as 40% of ophthalmologists practicing in the southwestern Nigeria axis. In other parts of the country again most are located in the big cities such as Kaduna, Port Harcourt, Kano, Jos, and Owerri with very few in the North-East geopolitical zone. Optometrists are surplus to requirements majority of them practice in the South-South and South-East geopolitical zones and Lagos with very few in the North. However, despite dwindling resources, dearth of workforce, and lack of sophisticated equipment, in most instances, ophthalmologists and other members of the eye care team strive to deliver clinical services, particularly cataract surgery. In 2013, there were 25 teaching hospitals and 22 federal medical centers in the country providing Tertiary Health Services to Nigerians. Most of them provide basic ophthalmic services which include cataract and glaucoma surgery. However, most lack the facilities to provide advanced medical and surgical ophthalmic services such as vitrectomy (advanced type of retinal surgery), laser, and corneal refractive surgery. Only two teaching hospitals provide partial vitrectomy services and a few private hospitals provide full services. The latter are very expensive and mostly out of financial reach of the average citizen. The worrying aspect is the increasing number of trained subspecialist ophthalmologists available in these tertiary hospitals with no equipment to deliver their expertise for therapeutic effect of the populace. Furthermore, diagnostic equipment such as optical coherence tomography, fundal camera, fundal fluorescein angiography, visual field analyzer, and autorefractors among others are either unavailable in most tertiary centers and where available are always breaking down frequently adding to the frustration of the eye care team. The infrequent strike action locally and nationally over the preceding years and to date has also constituted an impediment to eye care service delivery. The National Eye Centre (NEC), Kaduna, which is an institute of ophthalmology that is supposed to subserve the entire West African subregion is a shadow of itself. Surprisingly, this facility is in no better position than the multidisciplinary tertiary hospitals described earlier. Moving to the secondary health centers, which comprise the State general and specialist hospitals, the scenario is no better. Nongovernmental organizations (NGOs) such as sight savers international have been partnering with state ministries of health and education to local government authorities and community organizations in Nigeria for over 40 years to we have been preventing, curing blindness, developing workforce, and providing equipment and infrastructure. This has significantly impacted on the ocular health status of communities in covered stated. Many ophthalmologists prefer to work at the federal level where remuneration is much more attractive, thus leading to a dearth at this level. The diploma in ophthalmology course of the West African College of Surgeons in 2012 which hitherto provided middle-level ophthalmologist has been stopped. This further affected the number and quality of mid-level ophthalmic surgeons with many going on to do the fellowship program. Moreover, many state hospitals in addition lack the requisite equipment for effective comprehensive eye care service delivery. At the local government area, level base ophthalmologists are few in number and mainly comprise diplomates. The eye care system largely depends on ophthalmic nurses and integrated eye care workers. While some clinics and hospitals at this level are fairly well equipped, especially in states that have benefited from NGO intervention in those that have not are eyesores unfit for treating patients satisfactorily. In the private sector, several hospitals exist with some being managed by indigenous ophthalmologists, NGOs, or local/foreign partnerships that provide very good services comparable to those obtainable abroad if not better. Service delivery is prompt and of high quality and standard. The pitfall is the prohibitive cost of services to the generality of the populace. A combination of lack of workforce and equipment, coupled with incessant industrial action, and Nigerians love for foreign services has further led to increase in medical tourism with regard to ophthalmic care. New modern equipment has been acquired at the NEC, and several of the consultants have been sent for retraining and subspecialization. By this, it is envisaged that corneal refractive, phacoemulsification, vitrectomy, and corneal transplant surgeries among others will be carried out regularly. Furthermore, ophthalmologists from Nigeria and the entire subregion can come and have subspecialty training. The current state of health care as it relates to ophthalmology leaves much to be desired. The various tiers of government need to implement the WHO requirements for funding of health care to provide quality eye care services that meet global standards at affordable cost to the teeming populace. Cancer is classified under noncommunicable diseases, and it is expected to rise, especially as a result of westernization and aging population., At present, cancer is seen by many as a death sentence in Nigeria due to a lot of confounding factors which include a dearth of workforce, infrastructural facilities, and absence of political will to address this menace headlong. The three major pillars of health care are availability, affordability, and accessibility and where these three pillars are existing; a fourth pillar is sustainability. At present, in Nigeria, there are deficiencies in all the three major pillars of health care as it relates to cancer care in Nigeria. The available functioning centers in Nigeria are too few to take care of cancer patients with attendant medical tourism within and outside the country. Some geopolitical zones are without any radiotherapy facility which is a major determinant in assessing the availability of optimal cancer care in the country. For many, radiation therapy is not affordable because of the cost of treatment. Similarly, the National Health Insurance Scheme (NHIS) is yet to manage cancer patients. Patients pay out of pockets for their chemotherapy and radiotherapy. The bulk of the people resides in rural areas where no existence of any form of cancer treatment is available. Patients like these cannot be said to have access to treatment. At present, in Nigeria, there are seven tertiary health institutions in the country equipped with megavoltage machines which rarely attain 100% usage at any time due to frequent breakdown. At the time of writing this manuscript, only two centers are functioning for the teeming population of cancer patients in the country. There is a gross shortage of megavoltage machine in the country. Based on Nigeria population of about 180 million people and cancer incidences of about 180,000 new cancer patients per annum, using the International Atomic Energy Agency recommendation of one megavoltage machine per 250,000 population or 350 new cancer patients, Nigeria is expected to have at least 300 megavoltage machines, but ironically, Nigeria has only 7 machines with only 2 functioning.,, Definitely, cancer in Nigeria is a death sentence! Noninclusion of cancer patients under NHIS. To avoid cancer being a death sentence, the government, its partners, and all the stakeholders including the professionals must put all hands on deck to rectify these anomalies. Creating an enabling environment for public–private partnership. In conclusion, Nigeria faces a gross shortage of workforce, infrastructural facilities, and megavoltage machines. There is a need for aggressive measures by government and all stakeholders in creating new centers and equipping the existing centers with modern facilities and workforce.,, The government should create the necessary legislation for public–private partnership for optimal care of cancer patients. Diseases of the musculoskeletal system are the most common cause of long-term pain and physical disability in the world. They affect all age groups. The severe injuries caused by motor vehicular injuries, recent insurgencies demand restorative and rehabilitative efforts for a long time to come. Nigeria does not have a well-organized public or private transport system. This exposes the general public to risks of major musculoskeletal injuries with long-term consequences. As the population ages, more and more osteoporotic fractures will occur. It has been suggested that 25% of all health-care expenditure will be spent on trauma-related care by 2010. Crippling disorders of birth and deformities prevent a large number of people from reaching their economic and social potentials. Totally preventable diseases such as poliomyelitis lead to deformities that are lifelong and psychologically and physically disabling. Back pain now contributes up to 50% of all visits to orthopedic clinics in some developing countries. Joint diseases such as osteoarthritis are of special importance in the elderly. Indeed, most of the musculoskeletal diseases suffer from lack of effective preventive measures and lack of attention from policymakers. Research into these conditions is virtually impossible or at best rudimentary. People suffer their conditions in silence and have resorted to nonconventional means of treating their pains. The art of traditional bone setting which is unregulated has caused a lot of damage to societies without even a finger raised by the government. Many physically challenged people are a product of this system. There are currently three specialist orthopedic and trauma hospitals in Nigeria. Together with orthopedic departments of the university teaching hospitals, they are responsible for training specialists and treating complex musculoskeletal disorders. Their capacity to treat these conditions is not developed. There is a severe shortage of equipment, and the workforce aspect is greatly hampered by this. This needs to be addressed as a matter of urgency. Public–private partnerships, intramural practice have been introduced in some tertiary health institutions in Nigeria, but their results are yet to be evaluated. A lot needs to be desired in achieving the above lofty objectives. The NHIS coverage is limited to only 5% of the population that are employees of the federal government and their families. Despite this small number, there are many problems associated with it principally, customer dissatisfaction and poor payment of the registered clinics by the Health Maintenance Organizations. It is our hope that experience gathered from the management of the formal sector, care may be extended to the informal sector of the population and the state and local government employees. Cardiovascular diseases (CVDs) constitute the greatest burden of noncommunicable diseases in Nigeria. With increasing westernization of our diet and assumption of sedentary lifestyle, CVD and diabetes mellitus are increasing by the day. Mortality due to these diseases is 435.9/100,000 males and 475.7/100,000 female. Strokes and cardiac failure due to complicated hypertension form the majority under this group. The advent of fast foods and sugared drinks with little or no exercise completes the vicious cycle of obesity, diabetes mellitus, and hypertension. There is a strong relationship between smoking and chronic respiratory diseases. However, data on these conditions are not common. There is evidence to suggest that these conditions are not as prevalent in the rural areas as in the cities where pollution is common. “To be or not to be” this reflects the quandary of Prince Hamlet as he ruminated on whether to avenge the murder of his father by his uncle in William Shakespeare's play Hamlet. We are in a quandary. It can be inferred from the discussions above that health-care delivery in Nigeria is at crossroads. It requires to be held by the scruff of its neck by a concerted, dedicated leadership at the center, the states and local governments. The federal ministry of health should be purged of special interest personnel and groups who fuel intra- and interprofessional rivalries for their benefits. For healthcare to be accessible, affordable, and qualitative, the government must plan to expand the NHIS to everybody to stop the culture of “out of pocket” health for sale phenomenon. There is a need for the government to encourage the emergence of publically run and well-funded health facilities to harness the activities of highly trained specialists who can render services that are sought for abroad. These centers should have access to loans that can be serviced without duress so that highly sophisticated machinery and appliances can be acquired. Nigerian health care must change! National Population Commission (NPC) Nigeria and ICF International. National Demographic and Health Survey 2014. Abuja, Nigeria, Rockville, Maryland, USA: National Population Commission (NPC) Nigeria and ICF International; 2014. National Bureau of Statistics. The Millennium Development Goals Performance Tracking Survey 2015. Abuja, Nigeria; 2015. Available from: http://www. National”. [Last accessed on 2017 Nov 16]. World Health Organization. Country Statistics and Global Health Estimates: Nigeria Statistical Profile 2015. Geneva: WHO; 2015. Federal Ministry of Health. National HIV Sero-sentinel Survey 2010. Abuja, Nigeria: Federal Ministry of Health; 2010. Federal Ministry of Health. National Operational Plan for the Elimination of Mother to Child Transmission of HIV (e-MTCT) in Nigeria 2015-2016. Abuja, Nigeria: Federal Ministry of Health; 2014. Bankole A, Oye-Adeniran BA, Singh S, Adewole IF, Wulf D, Sedgh G. Unwanted Pregnancy and Induced Abortion in Nigeria: Causes and Consequences. International perspectives on Sexual and Reproductive Health 2006;34:175-84. Federal Ministry of Health. National Strategic Framework for the Elimination of Obstetric Fistula in Nigeria 2011-2015. Abuja: Federal Ministry of Health; 2015. United Nations Children's Fund (UNICEF). The State of the World's Children, 2015: Reimagine the Future: Innovation for Every Child. New York: United Nations Children's Fund; 2014. p. 29-95. Black RE, Morris SS, Bryce J. Where and why are 10 million children dying every year? Lancet 2003;361:2226-34. Lawn JE, Costello A, Mwansambo C, Osrin D. Countdown to 2015: will the Millennium Development Goal for child survival be met? Arch Dis Child 2007;92:551-6. National Population Commission (NPC) Nigeria and ICF International. Nigeria Demographic and Health Survey 2013. Abuja, Nigeria, Rockville, Maryland, USA: National Population Commission (NPC) Nigeria and ICF International; 2014. p. 117-278. Aigbe GO, Zannu AE. Differerentials in infant and child mortality rates in Nigeria: evidence from the six geo-political zones. Int J Hum Soc Sci 2012;2:206-14. Adetoro GW, Amoo EO. A statistical analysis of child mortality: Evidence from Nigeria. J Demogr Soc Stat 2014;1:110-20. World Health Organization. World Health Statistics 2015. Geneva: World Health Organization; 2015. p. 55-107. Kayode GA, Adekanmbi VT, Uthman OA. Risk factors and a predictive model for under-five mortality in Nigeria: Evidence from Nigeria demographic and health survey. BMC Pregnancy Childbirth 2012;12:10. Pelletier DL, Frongillo EA, Schroeder DG, Habicht JP. The effects of malnutrition on child mortality in developing countries. Bull WHO 1995;73:443-8. Available from: http://www.mrcophth.com/Historyofophthalmology/Introductory.htm. [Last accessed on 2017Aug 08]. Available from: http://www.aao.org/eye-health/tips-prevention/what-is-ophthalmologist. [Last accessed on 2017Aug 08]. Nigerian Opthalmological society. Vision for the future Nigeria Ver 1: 2006. p. 22-5.
WHO Global Data on Visual Impairments; 2010. www.who.int/blindness/publications/globaldata/en. [Last accessed on 2017Aug 08]. The Nigeria National Blindness and Visual Impairment Survey 2005-2007. www.iceh.ac.uk/nigeria-national-blindness-andvisual-impairment-survey2005-2007. [Last accessed on 2017Aug 08]. Available from: http://medicaltipsng.blogspot.com.ng/2013/03/list-of-teaching-hospital.html?m = 1. [Last accessed on 2017Aug 08]. Available from: http://www.sightsaverusa.org/our_work/where_we_work/west_africa/nigeria/default.html. [Last accessed on 2017Aug 08]. Omigbodun A. The membership certification of the West African college of surgeons and its relevance to the needs of the West African sub-region. J West Afr Coll Surg 2012;2:83-7. Salmineh E, Izekska J, Andreo P. IAEA's role in the global management of cancer: Focus on upgrading radiotherapy services. Acta Oncol 2005;44:816-24. Adewuyi SA, Campbell OB, Ketiku KK, Durosinmi-Etti FA, Duncan JT, Okere PC. Current status of radiation oncology facilities in Nigeria. West Afr J Radiol 2013;20:30-6. Hanson GP, Stjernswärd J, Nofal M, Durosinmi-Etti F. An overview of the situation in radiotherapy with emphasis on the developing countries. Int J Radiat Oncol Biol Phys 1990;19:1257-61. Nofal M, Durosinmi-Etti F, Hanson GP, Stjernswärd J. Supporting cancer care in the developing countries: Role of IAEA/WHO. Int J Radiat Oncol Biol Phys 1990;19:1249-56. Borras C, Stovall J, editors, Design Requirements for Megavoltage X-ray Machines for Cancer Treatment in Developing Countries, Report of an Advisory Group Consultation. Report No. La-ur-95-4528. Los Alamos, NM: Los Alamos National Laboratory; 1993.
International Atomic Energy Agency. Organization and implementation of a national regulatory infrastructure governing protection against ionizing radiation and the safety of radiation sources, International atomic energy agency. IAEA-TECDOC 1067. Vienna; 1999: p. 10. Björklund L. The bone and joint decade 2000-2010. Inaugural meeting 17 and 18 April 1998, Lund, Sweden. Acta Orthop Scand Suppl 1998;281:67-80. Murray JL, Lopez AD, editors. The global burden of disease: A comprehensive assessment of mortality and disability from diseases, injuries and risk factor in 1990 and projected to 2020. Geneva: WHO; 1996. World Health Organisation. Global Health Observatory. Non Communicable Diseases Country Profile. Nigeria: 2010. [Last updated on 2014; Last accessed on 2016 Sep 27].